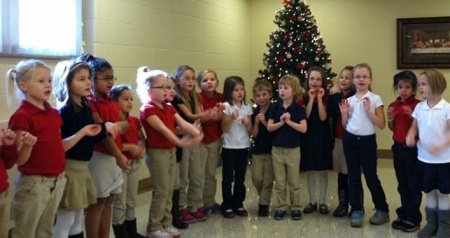 December 18th, 50 children from Sacred Heart grade school came to the monastery to sing Christmas songs for us. They were accompanied by their teachers, Linda Hammond, Terri Bowder and Carolyn Simon. This was the warmest day we had in the past few weeks, so it was perfect for them to walk here from their school. They quickly took off their coats and stood in a semicircle in front of us Sisters. The first song was a greeting song followed by songs about St. Nicholas, Santa Claus and Rudolph the Red-nosed Reindeer. Most of these songs were accompanied by actions. They concluded with “We Wish You a Merry Christmas.” It was obvious how much these young children enjoyed singing and we very much enjoyed their visit.